The Patagonia ambassador team is pleased to share today's interview with one of their newest members, snowboarder Forrest Shearer. Forrest joins fellow riders Ryland Bell, Josh Dirksen and Taro Tamai in the lineup. Raised as a surfer at the famed Dana Point, Forrest made the transition to snowboarding with his move to the foot of the Wasatch Range in Utah. We caught up with Forrest recently to ask him a few questions about what has been an eventful year of riding, and his plans for the upcoming season. TCL: You recently traveled to Japan to film for the new TGR film Further. What was the terrain like and how was it unique? Forrest: There was tons of good powder riding and big alpine terrain. 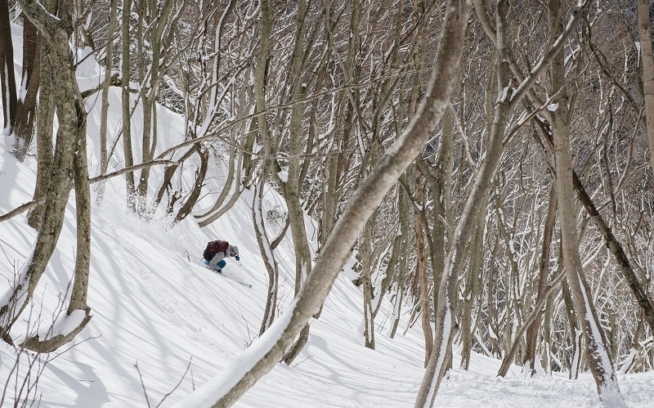 A lot of people don't know that Japan gets so much snow – it's insane. I couldn't think of a cooler place to snowboard and experience a different culture. TCL: You’ve traveled and ridden everywhere. What is it about Utah that makes it still your favorite place to ride? Forrest: Utah holds some of the sickest terrain and lightest snow on the planet. Conditions are either snowing or sunny. The constant progression of snowboarding that goes on here and the amount of people that are dedicated to the mountains is crazy. Its an epicenter for sure. Closest comparison would be the North Shore of Hawai'i. TCL: What is it that inspired you to start really relying on and promoting split boards and human power to access the mountains? Forrest: With split boarding, I'm using my own two feet to get where I'm going, which is a gratifying feeling. I become more in tune with my surroundings and get closer to nature since it's just me and the mountains, no disruptions. I also learn what’s going on with the snow pack and the stability. When you’re taking a heli or snowmobile up, you may only have one objective planned and because you’re getting there quickly, you miss out on other stuff along the way. When I'm hiking for a line, I see 10 to 50 options instead of one. I get to read the terrain more and get creative. TCL: There are a lot of environmental groups and issues out there. How and why did you get involved with the ones you have (Protect Our Winters, the Alliance for Climate Education and the Action Sports Environmental Coalition)? What is in the works now? Forrest: Most of the nonprofits I support were started by friends in the industry. I’ve gotten involved with other groups because of issues I'm passionate about and want to highlight with the influence I have as a professional athlete. This fall, I’ll be traveling to schools in mountain communities for the POW/ACE Hot Climate/Cool Athletes campaign, helping Heal Utah keep radioactive waste out of the state, and supporting Surfers for Cetaceans on their Transparent Sea Voyage down the California Coast to bring awareness to ocean pollution, and dolphin and whale protection. I’m also working with The Wilderness Society on their upcoming My Wilderness campaign. TCL: Did your time filming Deeper affect your riding and interests or was your participation the result of an evolution in your riding? Forrest: I think all of the above, for sure. Before filming for Deeper, I always strived to be a well-rounded snowboarder. Now, after Deeper and moving forward with Further, my interests are evolving to not only to be a well rounded rider but also a well rounded rider and alpinist and integrate that even more into my riding. It's a constant learning process. Also riding for Jones Snowboards and filming with TGR has had a huge impact on my riding. TCL: How has your riding influenced your clothing needs? Forrest: I'm out in the snow every day – from before sunrise until sometimes way after dark. More than anything I need gear that performs the best and will hold up to the elements. My clothing becomes a part of me when I'm out in the mountains. It's like a second skin. I rely on it to get the job done. TCL: Why did you want to get involved with Patagonia? Forrest: Patagonia is a company on the forefront of clothing and the environment. I've always admired the company for what they stand for – staying true to their roots. They are making the best gear out there and actually putting love into what they make. I’ve been really stoked on their surf team and the direction they've gone with their wetsuits and surfboards shaped by Fletcher Chouniard. TCL: You grew up surfing in Dana Point. How has your surf background influenced your boarding? Why did you decide to dedicate your life to boarding instead of surfing? Forrest: Sometimes when I'm snowboarding, I want to do a big surf turn and instantly the snow becomes a wave. Then with surfing sometimes I find myself going fast down the line like I'm snowboarding. With both you feel this effortless glide of planing on water or snow. It's the best feeling in the world. Riding a snowboard in powder is surfing, snow surfing. The mountain is this frozen ocean that has endless possibilities. I grew up in the ocean, surfing and skateboarding from a young age. The mountains were always far away for me. So I decided to make the quest to check out snowboarding and instantly was hooked. I became dedicated to it. I found this similarity to the surfing world in the mountains, a sense of community and having respect for the environment. TCL: What was the objective of your recent trip to Haines with the Sweetgrass crew? Forrest: The trip was based around riding in Alaska, snow camping on the glacier, and enjoying adventures with a good collective of friends. Haines is such an amazing place. I definitely consider it the mecca for big mountain riding. It's holding some of the biggest and steepest lines out there. TCL: What is your involvement in snow safety education? Forrest: I'm involved with the Utah Avalanche Center helping to educate kids about some of the dangers to be aware of when backcountry skiing and snowboarding. Snowboarding has given me everything. I’m stoked to help out and give back. TCL: Do you have any new film parts coming out this year we should look for? Forrest: Yes, I have a couple new parts coming out that should be cool. The new Sweetgrass film Solitaire is coming out this fall, which should be a rad flick. I was down in Las Leñas last summer filming for that. We didn't get a ton of snow when I was there, but had a good time looking for couloirs and riding horses. Ryland Bell also has a sick part in the film. He was down there this summer filming. Breaking Trail will be out this fall. I got the chance to film with the PW crew in my backyard of Utah. Their past films have been tele-skiing only. I’m excited to see how it turns out. Also in the works are new webisodes for the long anticipated Further, in preparation for the feature release next season.